We have a **NEW** website (www.highnamchurch.org) where you can find full detail of our day-to-day activities, future events and contact details if you wish to visit the church. 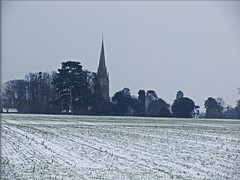 We are a Church of England parish church serving a mainly rural community on the west side of Gloucester city. 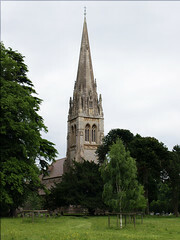 The church building itself is impressive, and with its position near to the A40 west of the city, and with the floodlit spire is well known to the many people who drive past on the main road. We are also privileged to have a church which has extensive wall paintings depicting scenes from the Bible and we are pleased to be able to offer visitors a talk on the origin and meanings of the events shown. Have a look at the webpage 'History of Highnam Church' for more information about the church. Our 'Visiting the Church' and 'Contact Us' pages gives details of how you can find the church and arrange a visit.